I had a mid-week day off last week and it was raining cats and dogs, which was all I needed to set off a craving for something simmering on the stove. What’s better than a pot of full-flavored bolognese slowly bubbling and creating a homey feel about the place? In my opinion, slow cooked meals conjure up a sense of contentment, ease, happiness and anticipation. This recipe comes together casually over the course of several hours. Add a little here and simmer, then a little there and simmer…you get the idea. Imagine creamy polenta with shredded asiago stirred in, and plenty of butter, then ladle a generous amount of bolognese sauce over it and top it off with a spoonful of parsley pesto and a scattering of parmesan-reggiano. Delightful in every way. Six Hour Bolognese Sauce – This six hour bolognese sauce came about after after reading several online recipes. Rub the salt into the ground beef and allow it to sit to room temperature. In a large saucepan or Dutch oven over medium-low heat, add the oil and butter. When the butter melts, add the onion and a good pinch of salt and pepper. Saute until onion 8-10 minutes. Add carrots, celery, another pinch of salt, and cook another 8-10 minutes. Add beef and cook until all the pink is gone. Make sure you break up any big clusters of beef. Add milk. Reduce heat to low and stir frequently to prevent scalding. Simmer until all liquid has evaporated, about 1-1 1/2 hours, stirring every 10 minutes. Add nutmeg. Add wine and simmer as you did the milk and simmer for another 1-1 1/2 hours, stirring about every 10 minutes. Carefully add tomatoes, stirring them into the sauce. Reduce heat as low as it will go, and cook for 3 hours. Stir occasionally to make sure nothing sticks to the pot. Adjust seasoning with salt and pepper, if needed. Serve over pasta or creamy polenta and top with Parmesan cheese and pesto. Combine the vegetable stock and salt to taste in a heavy pot over medium-high heat. Bring just to a boil, reduce the heat to medium-low, and slowly, whisking constantly, add the cornmeal in a thin stream. Cook, stirring constantly, until the polenta pulls away from the sides of the pot and most of the liquid has been absorbed, about 20 minutes. If you polenta is too thick add little boiling water until desired consistency is met. Remove the pan from the heat, and stir in the cheese and butter. Whizz all ingredients in a food processor until well combined. Taste and adjust adding more salt or parmesan if needed. 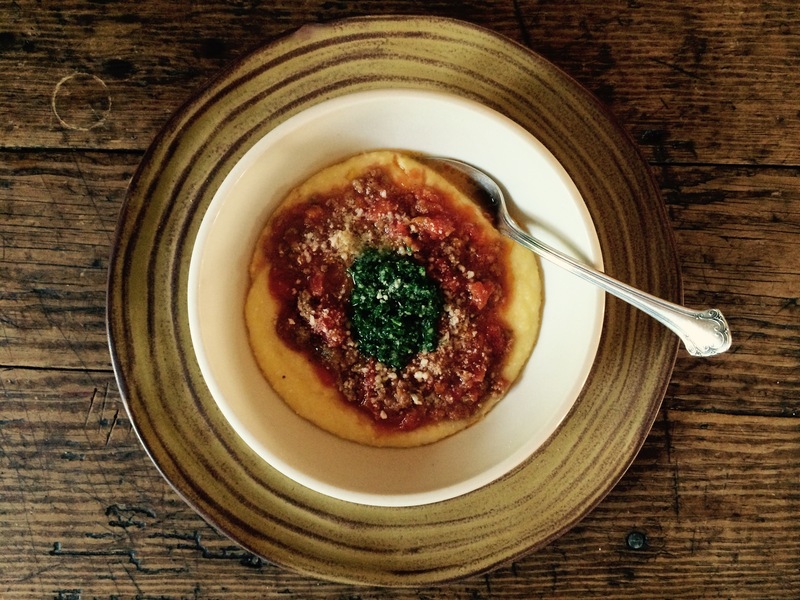 You are currently browsing entries tagged with creamy polenta with bolognese at COTTAGE GROVE HOUSE.